"A beautiful and light take on a fall salad. The tastes mix well together and it can be served hot or cold. I like to pair it with Dijon-crusted salmon!" Stir chicken broth and quinoa together in a saucepan; bring to a boil, reduce heat to low, place cover on the saucepan, and cook until the broth is absorbed, about 10 minutes. Remove saucepan from heat and fluff with a fork. Whisk olive oil, Dijon mustard, maple syrup, and cinnamon together in a bowl; season with salt and pepper. Drizzle sauce over the quinoa; stir. Add apple pieces, pecan pieces, cranberries, and Parmesan cheese; stir. Return cover to the saucepan and let the mixture steam until the sauce warms and the apples soften slightly, 5 to 10 minutes. 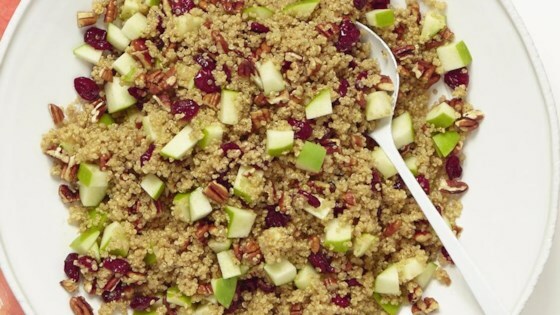 If you would like to serve the salad cold, you can prepare the recipe the same way, but don't add the sauce, cranberries, apples, and pecans until the quinoa has cooled. Then, mix all together in a bowl and refrigerate for at least 30 minutes. The cheese absolutely ruined this dish. I really liked this as a warm side dish. I added the chopped apple at the end as a personal preference and forgot to add the cheese, not sure it's needed. A nice change from rice. Absolutely delicious just the way the recipe is. I tried it with and without the cheese. Either way it's amazing! Thank you for sharing this recipe! This salad is great and very easy. Just my style! Made with the cheese the first time, not great, especially warm. Try cold using Feta. Loved the sweet and savory combination! Definitely a do over!! !